There are many acclaimed steakhouses in Singapore but I decided to try Morton’s since I’ve read that they do exceptionally well for special events and I had wanted to bring my friend there for her birthday. So being our first time at a high range steakhouse, we didn’t really know what to expect from the menu. Thankfully, the staff popped by and offered his knowledge — explanation of the types of cuts available, weight, etc. Feel free to ask him anything! Okay. The food. Ready? Pardon me if they don’t look as appetizing as they should be. The dimly lit place made it not so ideal for taking pictures, and it was quite embarrassing to take amature pictures in a fine dining place. You can, however, get a rough gauge of how the food looks like from the pictures my friend had secretly snapped. Ribeye ($99), grilled medium plus. Medium plus means it’s inbetween medium and medium well, which was was what we originally wanted (medium well) but the staff suggested that It wouldn’t be as nice so we took his suggestion instead. The picture above, is only half. the. steak. The whole steak is a whopping 340g so I told the staff that I would share it with my friend, and it came nicely separated into two plates! The steak is only seasoned with salt and pepper but that’s enough. Accompanying sauces, like the usual mushroom or black pepper, would have killed the natural, delicious taste of the steak. Texture wise, the steak was evenly grilled. It was flavorful on the outside, just before charring, with a warm healthy pink in the middle. The steak was roughly about 1.5 inches thick, so I was satisfied at the way it was cooked, perfect the way I wanted it — pink but yet non bloody. 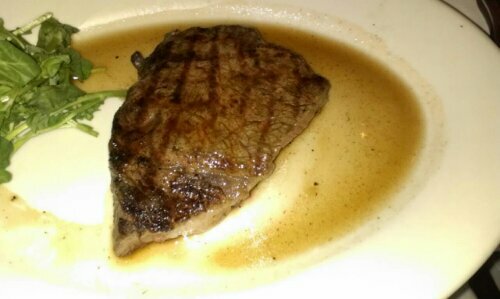 Unlike other thick steaks where one would chew to the point of chewing gum, this steak didn’t give me that problem at all. My friend and I devoured our entire respective halves in no time. Baked seafood platter for two ($85). As we ordered only one steak to be shared between the both of us, we decided to order a baked seafood platter for variety. A cold platter is available as well, if you’re wondering. 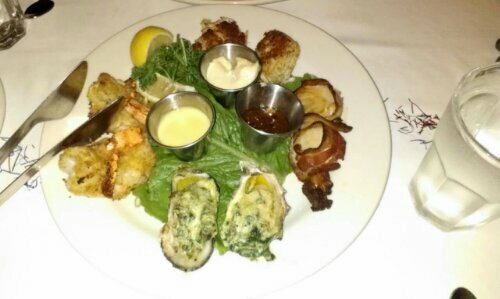 You can’t tell from the picture, but there were oysters, jumbo prawns, crab patties and scallops wrapped in bacon. What I liked about this dish was that apart from the oysters which was topped with it’s own sauce, every other item had a special sauce (not mayo or wasabi mayo hor) to go with them. Blame it on my poor memory, but I could only remember the Apricot Chutney which was my favourite. I loved the scallops. Huge and juicy, it would do just fine without the bacon. That’s how good it is. My friend said that the jumbo prawns were the biggest she has ever eaten. Wow. I don’t usually eat prawns but this was good. Just a note for those of you who are planning to visit: the seafood platter was served at the same time as our steaks. Wanting to savour what we came here for, we left the platter aside till we were done. I told my friend that we should have requested for them to serve the platter after we were done with our steaks. On this issue however, once we were done with our steaks, the staff provided us with warm plates for the platter. I really didn’t expect this. It did help with the food, but I still wished the food could come piping hot, since the jumbo prawns was fried. Now I know what to do in future! 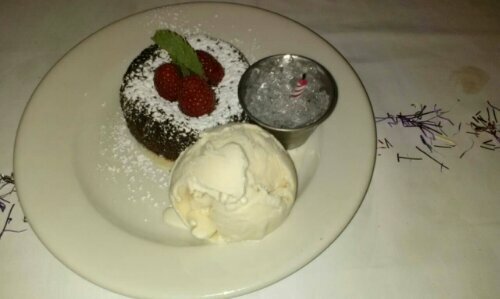 Morton’s chocolate lava cake ($30). Look! It came with a candle and the staff offered to take a picture of us. Thinking that they had wanted to put the picture on their facebook page or webpage for publicity purposes, we were instead presented with a hand made card enclosing the picture! The lava cake is definitely the best one I have ever eaten. It’s huge yes, but somehow you won’t get the jelat feel after a few mouthfuls. I would even go a step further and say that every mouthful is bliss. Every single bite is a brand new, refreshed taste of “damn this is too good”. I’m not a fan of chocolates but this really got me wanting for more. The ice cream that came along with the cake is not your usual vanilla. This vanilla is creamy and has somewhat a thick double layer taste, complementing the lava cake just right. A great, great end to a wonderful meal. Morton’s has done exceptionally well in making someone’s special day even more special. I highly recommend this place if you’re looking for great steaks and excellent service. Way to go!